Corrugated Stainless Steel Tubing (CSST) is a material being used in place of traditional solid steel gas pipe to route gas from a main gas line in a home to a gas appliance such as a clothes dryer, stove, or gas fireplace. The major benefit of CSST is that it’s flexible, making installation much easier. It’s also less expensive than the traditional pipe. CSST can usually be identified easily by its yellow coating. There have, however, been instances where CSST has punctured during a lightning strike near a home. If punctured, natural gas would leak from the tubing, putting the home at risk for fire or explosion. 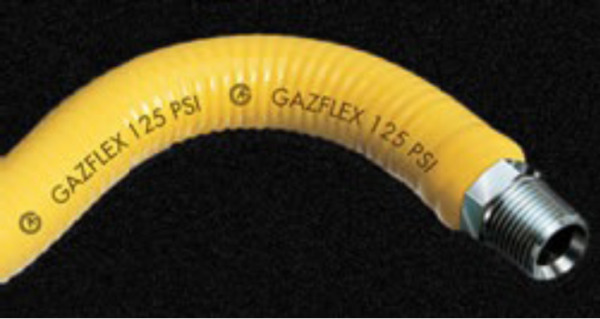 The risk of puncture by lightning can be reduced or eliminated if the gas piping system in your home is grounded. Click here for a more thorough explanation of this issue, as well as images of proper and improper grounding systems. Contact a licensed electrician to discuss this issue.